Because of the predominance of inflammatory acne lesions, severe grade type 4 acne calls for prompt aggressive systemic and topical therapy. 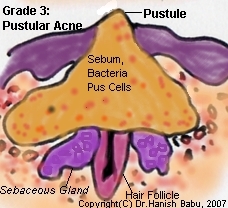 Inflammatory pustules and deep acne bumps (nodules) are predominant in severe acne or acne grade 4. More than 100 comedones, or more than 50 papules or pustules and more than 5 nodules with a total count of more than 125 acne bumps comprise severe acne. How is Severe Acne Formed? The initial pathogenesis behind severe acne is similar to other types of acne, viz, hormone stimulation of the sebaceous glands, thickening of the follicular wall and blockage of the hair pores. In severe acne, the resident bacteria of the hair follicle, P.acnes, multiplies in the medium of the sebum causing breakdown of its components. This causes a chemical irritation, attracting inflammatory white blood cells known as neutrophils. Neutrophils release some chemical mediators and enzymes which cause the typical characteristics of an inflammatory reaction within the sebaceous glands and the associated hair follicles: calor, rubor, dolor, tumor and functio-lesa, meaning: heat, redness, pain, swelling and loss of function of the affected area. The inflammation and the resultant destruction of the follicular walls, sebaceous glands and the debris from the inflammatory reaction results in formation of pus filled bumps known as pustules. The wall and sheath of the gland and hair follicle expand in the dermis with the pus to form deep seated nodules. What are the Triggers of Severe Acne? The acne triggers inducing, aggravating and maintaining severe acne is similar to all other types of acne. Picking at the acne bumps and application of topical steroids worsen the severe acne. Picking at the acne bumps and application of topical steroids worsen the severe acne. What is the Best Treatment for Severe Acne? The best treatment for severe acne is systemic retinoids. Because this is a strong medication with local and systemic side effects and chances of fetal abnormalities, it is not usually advised to females of child-bearing age group and during pregnancy. Females and their partners should use a double contraception of barrier plus pills while on retinoids. How Long Should Severe Acne be Treated? The duration of treatment varies from individual to individual and the response to anti-acne treatment. The average duration of treatment with oral isotretinoin is 18-20 weeks up to a maximum of 24 weeks. An interval of 3 months is given in between before a fresh course is started. Those on oral antibiotics and topical applications may have to continue treatment for longer duration, till the active acne bumps stop appearing. Then, the dosage is reduced gradually, and stopped over a period of 1-2 months. The topical antibiotics are also stopped like wise. Topical benzoyl peroxide is continued till no fresh acne bumps appear for a period of 2-3 months. Maintenance therapy of healed severe acne is with topical tretinoin, usually with the 0.025% concentration. This is important in preventing recurrences. Any recurrence is dealt with the same way as new acne bumps and the best treatment for severe acne re-instituted at the earliest to prevent formation of acne scars.